If you are a child, like a toddler or a baby, then you do not have to worry about whether your feet are flat or not. It is normal for kids in those ages to have flat feet due to the fact that their bones (and that includes the ones on the feet) are still developing. The thing is, for the mere reason you are reading this article, you certainly are not an infant nor a toddler. So don’t just go about looking at the sole of your foot just yet, reading and finishing this article may just give you more information than just by looking at your foot’s sole. Before we proceed, let us go through the definition of what we call “flat feet” or “flat foot.” Sometimes called “fallen arches,” doctors scientifically call this defect as Pes Planus. It is a postural deformity wherein the arch of the foot is collapsed, making the sole of the foot appear to the human eye as somewhat flat and its entirety completely (or almost completely) touching the ground. ► Your feet tire easily when walking. ► Your soles and your heels feel sore after a long stand. ► The middle part of your bottom feet is swollen. ► Tiptoeing is not something you can do. ► Your feet and legs ache often. Human babies are normally born flat-footed. As they grow up, their feet will gradually develop normal positioned arches. Some children will even have flexible foot arches or “flexible flatfeet,” wherein they become flatfooted only when they stand but normal footed when they are sitting, lying down, or tiptoeing. If such is the case, then what causes the feet to not develop normal arches or, if they do develop, what makes them flat again? Read on and learn. ► Birth defect – the cause is genetic. If the child has family members, who are flatfooted, then the likelihood of the child becoming flatfooted as well is highly probable. ► An inflamed or damaged Posterior Tibial Tendon – this is the tendon that connects the lower limb muscle passing through the ankle down to the foot’s arch. ► Nerve and joint problems such as rheumatism and arthritis. 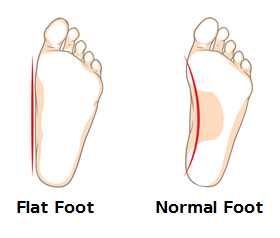 Some of the risk factors that compound the causes of flat feet are obesity, old age, inappropriate or uncomfortable footwear, improper foot and lower limb posture and movements. Flatfooted people, who do not feel any pain or inconvenience with their feet, will normally not need any consultation from a podiatrist. However, if you are flatfooted and your condition is making walking and other foot-leg movements difficult or hurtful, it is best to have a session with the podiatrist and let him do an assessment of your foot health. ► Resting, relaxing, and applying ice on the foot to reduce swelling and pain. Note that these treatments are recommended and performed only after a thorough examination and assessment has been done by the podiatrist. The normal foot is structured with its middle bottom curved like an arch. A flat foot has its arch collapsed and is nearly or completely touching the ground. There is no cause for alarm if you find yourself to be flatfooted given the condition that you are not experiencing pain or inconvenience which makes you unable to walk or do foot movements. However, if you have a flat foot and pain is hampering your activities because of such condition, it is better to see a podiatrist and have it checked up. If you are a podiatrist and you want online exposure for your medical practice or may you know a podiatrist who has helped you and you want his service to be known by many, feel free to make contact with us.